Boat launch ramp opens at 7 am and closes by no later than 9:30 pm or dusk, whichever is earlier and as determined by Park Operator. All boats must be out of the water by ramp closing time. Boat launch open year-round. All boats arriving on a trailer must be launched from the boat ramp. The charge for use of the boat launch is $6 plus tax with a 10-launch pass available for $50.00 plus tax. No launching fee charged for boats transported on top of a vehicle. Car-top boats may be walked down to the water at any location except designated swimming areas. All boaters with trailers must register at the Campground Office located at the main park entrance in Northpark. All registered boaters must carry the Horne Lake Boating Map and Regulations (provided at registration) on-board at all times. No parking of vehicles or trailers at the boat launch. Boaters must park vehicle and boat trailer in a campsite or designated boat trailer parking area with Registration Tag showing on vehicle dash. Depart from boat ramp straight out into Lake; approach boat ramp straight on. 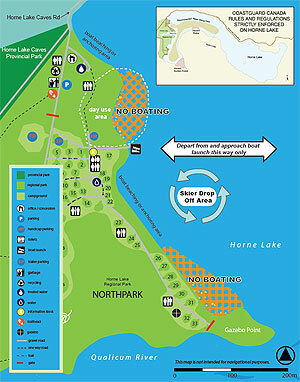 Drop off water-skiers using counter-clockwise turn on south side of boat ramp (see Horne Lake Boating Map). No boating within hatched areas on boating map. In the Northpark boats may be beached or anchored in designated areas during the day and overnight. At Paradise Bay and Twin Pines, boats may only be anchored day or night - no beaching at any time. The majority of Horne Lake is private; therefore, Horne Lake Regional Park is the only place to go ashore. Respect all private property and waterfront. No camping and washrooms anywhere but at the Regional Park. Recommended water-skiing area is from the Regional Park to the Hydro lines crossing Horne Lake. Canadian Coast Guard (CCG) regulations strictly enforced at Horne Lake. CCG shoreline speed restriction: 10 km/h (5.4 knots or 6.2 mph) while operating within 30 m (100 ft) of shore. Nearest fuelling facilities at Bowser and Qualicum Beach. See Horne Lake Boating Map for hazards around Horne Lake, and watch for sudden high winds and waves. No septic discharge or garbage to be thrown into Lake. Provincial freshwater fishing licences are required for Horne Lake and the Qualicum River. The lake is stocked with Cut-throat and Rainbow trout. Licences are available for purchase in Qualicum Bay and Bowser. BC residents aged 16 and under may fish without licence.